Toscana, the newest addition to Downtown Lafayette’s dining scene, recently opened in the Holiday Inn Select City Centre in the former Sarge Oak location. As you can probably guess by the name, Toscana features a variety of Italian dishes and desserts and sports a full bar. According to hotel information, Toscana serves breakfast, lunch and dinner, is open seven days a week, and is committed to sourcing fruits, vegetables, herbs and other ingredients locally from sustainable sources. On-site parking is available, but the lot also serves hotel patrons, so space runs out quickly. There is some street parking available on adjacent side streets as well as access to the municipal parking garage nearby. In the evenings, there is parking available in the Regions Bank lot across the street, but we’re not 100% sure we were *supposed* to be parking there. We had a drink at the bar before sitting down for dinner. THe bartenders need more training if the managers of Toscana want this place to be nicer than a regular old Applebee’s. The place was almost empty but there were several dirty glasses left on the unclean bar while the bartenders talked to each other. My husband was given a beer in a bottle without even an offer of a glass. In a nice bar, a chilled glass is always given! We had a full view of piles of dirty pitchers and glasses and other dishes under the bar. Not a nice atmosphere for date night. Our food was stodgy and didn’t taste freshly prepared. The dishes were uncreative and I honestly felt like we’d have had a better meal at Olive Garden. This restaurant promotes itself as a more upscale facility than family dining places around town, but the service, food quality, and atmosphere do not reflect it. I don’t get it,my experience there was an absolute delight! My guest and I started in the bar where the bartender(Charlie) was very attentive,funny and knowledgeable. Being an ex bartender myself I was impressed not to get another beer pourer like other places downtown. We then then moved to the actual restaurant, very very good service from our server(Britney). She sold us both on the Chicken Picatta. And with no better words,the best Italian dish I have ever had.Just wanted to let everyone know this place was great! Thank you to the whole staff again,and when we return to Lafayette we plan on a trip to Toscana. I’ve been to Toscana twice, most recently two weeks ago with out-of-town guests. The pasta meals were excellent and the wine list very reasonably priced, and the tiramisu was great. If there were problems with the food before, they’ve pretty much cleared them up now. I’ll be bringing more guests in the future! 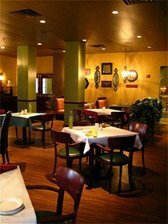 I’ve eaten at Toscana a number of times (10+) for different occasions. First, a business function in the evening, several dinners with friends,and many times for lunch. The food is good. Their soups are delicious and made on-site. The crusty French bread is also very good. Steak and fish entrees that I’ve sampled were tasty. Desserts (at least the cheesecake and another berry/cheese confection) have room for improvement, as they were approx. $7 and did not taste very fresh. The salad, soup and pasta lunch buffet is a terrific choice with fresh strawberries and made to order pasta for a reasonable price. There are few decent independent restaurants in town. Toscana is a good choice, all things considered. I had dinner at Toscana last Friday with a friend. We wanted to have a fast dinner and we just order an appetizer and a pizza. The appetizer was good with salami and olives (3 or 4 different varieties), tomatoes, artichokes and cheese and bread. It was very well prepared. The pizza was thin and crispy and well cooked. What a pity that the restaurant was almost empty! Just few people were eating there. And also too dark! I would suggest to adding more bulbs! The food was decent. The only problem was our waiter, we think his name was Rick, seemed indifferent and hardly paid any attention to us. He verged on being downright rude. Why would a place as nice as this hire a person like that to serve? Pitiful. My wife and I decided to try Toscana for the first time a few nights ago and boy were we disappointed. Our excitment over checking out a new place turned to suspicion when we showed up to an empty restaurant on a Saturday night. Our waitress seemed friendly and attentive, and the dining room looked nice, but that’s about the only good thing I can say about the place. The bread was a complete disaster. You can purchase much better bread at the grocery store. This was the plainest, most tasteless bread I have ever tried. Jimmy John’s and Subway can handle making good bread, so I knew we were in trouble from the get-go. A quick glance at the menu quickly nullified Toscana’s claimed “commitment to sustainable and local food sources” trumped on their website. Since when did calamari and oysters appear in the Wabash? Why is there not a single creative pork or corn dish on the menu? I don’t really care all that much if a restaurant uses sustainable and local sources, but don’t insult your customers intelligence with obviously brought-in food. We ordered a the lasagna and shrimp linguine (who knew shrimp were local to Lafayette?). They came with salads that were plain Jane to say the least. We were asked what kind of dressing we wanted and when we asked what the house dressing was it didn’t seem there was one. I would bet thats because they all came from a bottle. The lasagna was disgusting. Not even edible. Stouffers does a much finer job of making lasagna. I would have sent it back back, but the shrimp linguine was also fairly miserable, so at this point we were just ready to leave. We promptly recieved our check and paid a shade over $70 dollars for what, in my opinion, amounted to a half a loaf of the cheapest french bread, shrimp linguine I could have made, lasagna that is beat by most TV dinners and a bottle of cheap, blended screw top wine. Having been in Lafayette for only a few years I can say this is the worse dining experience I have had in the city. Don’t even bother going. My husband and I stayed in the hotel overnight and went to Toscana for breakfast the next morning. The buffet is not bad but the juice is expensive- $3 for around 8 oz! The hostess made us feel unwelcome and was rather snobby. We will not be going back. We took our out-of-town friends, my mother, and our daughter out to eat last Sunday. The meal was poor, waitstaff inattentive, and service slow. At most there were 3 or 4 tables in the entire place, drinks were served slowly and not the waitress was so busy flirting with 2 men at another table, that she failed to offer a second glass of wine or cocktail. Five of 6 dinners were served and everyone had to wait for the 6th meal to arrive. We won’t be back, and it is too bad, as it is a great location with such potential. Our “Mothers Day” experience at Toscana was not pleasant. My husband booked the reservation in advance and was required to provide a $50.oo deposit to hold. When we arrived we discovered it was the buffet…not something I enjoy… but did not want to lose the $50.oo deposit. We should of… the service was not great our water glasses were left unfilled or the servers would pour water on the floor as they filled the glasses (more than once) gross. The food was not terrible but only mediocre at best not worth the $65 we were charged for a family of 4 with “Mom’s” meal half price. We were also surpried by a mandadtory 18% gratuity. I’ve only been for lunch, but the food was mediocre for the price and service was slow. I booked internet reservations for this restaurant. When we got there, they had no record of us doing so. That should have been the sign to leave. The bread was cold and my wife’s shrimp was like rubber. THe portions were tiny. They took her meal back after she had three bites and charged us for 1/2. My chicken parmasean was bland and had no flavor. I’d put it equal to Fazoli’s with a $40.00 pricetag. Go to LaScala downtown, it’s on a different plateau and around the same price. We have eaten at Toscana 4or 5 times and love it. Not your run of the mill Italian restaurant but more like dishes found in Italy. The meatball sliders, artichoke appetizer and bruschetta are very tasty and I’d go there just for the Berry Tiramasu and Lemon Cake. Very light and refreshing. The restuarant and new bar area are a vast improvement over the old Sarge Oak and the bar and lounge area is a really cool place to have a beer and watch TV. I’ve had many of the dishes including lasagna which I thought was great and the steak which tasted as good and was cooked right. My husband loves the all maet pizza with the thin crust (can’t think of the name). I’ve taken my 80 year old parents there (who go out to eat 5 nights a week and are very, very picky) and met my high school girlfriends there and we didn’t have any issues or problems. I’ve been there when it was packed and when it wasn’t but always enjoyed it. When we first went, about a week after it opened, the staff seemed inexperienced but eager but I don’t think that now. I really like this place and don’t understand the comment about the bread. I’d be happy just eating the bread right out of the oven. My wife and I have been there for dinner 4-5 times over the last six months or so and really enjoy it. Last week we were there on a Friday night and the place was packed. It was the first time we have seen it full and the first time we had to wait for a table, but it was only about 5 minutes. The appetizer came out very fast and was excellent as always. The waitress seemed a little inattentive and was the only negative because my water glass got empty a couple times. But the food was very good and the portions are ample. Often there is enough food left for lunch the next day. The lasagna is about the size of two fists. It is comparable to La Scala and quieter, even when full, than Olive Garden. It is a vast improvement over Sarge Oak. I’m reading the reviews so far and I can’t believe we even ate at the same restaurant! My party of four were seated promptly and the hostess that met us was so sweet and friendly. Our server was named Katie and she was awesome. Always smiling and very friendly. We ordered two of the pizzas, the grilled chicken and the fried artichokes for an appetizer. The food was great, the service was great and prices were reasonable. My family and I will definitely go again. Our first visit to this restaurant is likely to be our last. We called to ask for reservations and were told that none were needed. When we arrived a small man with an attitude informed us that they were very busy and we should have made reservations. After explaining that we had tried to do so he told us that he would ‘squeeze us in somewhere’ and the three of us were seated at a table for eight. There were three tables for four that remained empty the full time we were there, and I don’t think the dining area was ever more than half full. There were two waiters working, both very young, and while they seemed to be trying – they were very inexperienced. Ours read the special (yes, there was only one) from a sheet of paper – badly. He then asked if we were ready to order. We felt as if we were rushed the entire time. I ordered the quartered artichoke appetizer, and was immediately asked what I wanted to order for the meal. I told him I would prefer to order that when the appetizer arrived. The appetizer was the best part of the meal. I had the ribeye and the other two ordered a pizza. The pizza was very good, the ribeye was cooked properly – but not a very good piece of meat. The side dish was spaghetti and had a funky taste to it that I can best describe as stale dairy barn. The check was left at the table right after the main course arrived – and that made for some difficulty when we ordered desert. All in all, nothing to write home about – more like pub grub at upscale prices. We were in – out and done in less than an hour. Olive Garden is better in both service and selection, and their wait staff know their product. La Scala or Bistro 501 are far superior in all aspects yet Toscana is comparable to them in price. I have just returned from our holiday lunch and am apalled. First, I was greeted very abrusquely by the host. I had a question, which he did not allow me to finish and did not hide his irritation that the complete party was not in attendance. Secondly, we were seated at a table that was draped in brown paper (which all of them were). Since when is a restaurant worried about the table clothes being messed? The silverware was dirty (thank goodness for two forks – the water spots could be wiped away with the napkin). We were not told of the soup of the day or if there was a special of the day. It was not until we began to order and the waitress was asked if there were not other pasta dishes that we learned of the soup/salad/pasta bar. We had to remind the waitress of items ordered and not delivered. We had to wait an unacceptable amount of time for our beverages and then the orders were wrong. The most intolerable mistake was – one in the party had ordered a specific type of beverage. The waitress came with another beverage and proceeded to say that if the person “really really want what you ordered, I’ll get it for you but this one that is opened is from the same brand. And since this is opened, I thought maybe you wouldn’t mind taking it instead.” Being the gracious person that they are – they took it. For the food – I have spoken with everyone in attendance – no one appreciated their orders. I might have been able to overlook the service if the food had tasted anywhere near what Italian food should taste like – or I might have been able to overlook the food if the service had been anywhere near gracious, accurate and prompt. Unfortunately, it would seem that still the best Italian restaurant in the Lafayette area is from the restaurant chain “Olive Garden”. My friend and I recently had dinner at Toscana and we felt a little disappointed at both the prices and the food. I ordered the eggplant parmigiana and she ordered chicken picatta (or something very similar) and we each had the dinner salad with balsamic vinaigrette dressing. The bread was okay… nothing to write home about. The salads were nondescript iceberg lettuce that were a little on the dry side, and the dressing tasted like regular, out of the bottle stuff you would get at the grocery store. My eggplant was very thinly sliced (more than I expected) and the sauce was overly sweet… almost ketchup-y. Her chicken picatta was presented nicely, but the portion size seemed small for $17. The staff was attentive and the restaurant was clean and comfortable; however, for nearly $40 for two people who did not order appetizers, alcohol or dessert, we felt like we could have gotten a tastier and more filling meal at Olive Garden. I haven’t been there for lunch or dinner, but a whole group of us went there for breakfast one morning. It was delicious! The food did take a while to come out (perhaps 20-30 minutes after we ordered) and nobody else but us were in the restaurant. But they had a big variety from french toast, eggs benedict, pancakes, oatmeal, omelets, breakfast burritos, etc. pretty much anything you’d want. The potatoes that come with the breakfast are awesome, and I usually don’t like breakfast potatoes. Anyway, if you have the time to sit down for a nice meal, the food is delicious and the wait staff was friendly. Just for pricing–my eggs benedict cost like $11.99 before tax. Enjoy!